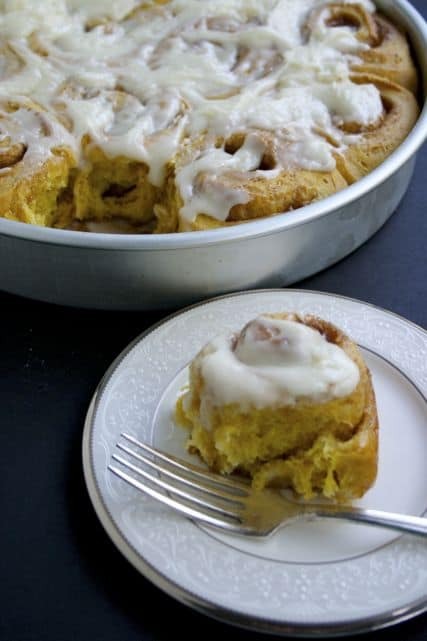 Cinnamon buns have to be one of my favorites sweet treats, although I don’t make them often. When I do, I love to make them on the weekends, letting them rise slowly overnight on Saturday night and then baking them on Sunday morning. The smell is just amazing and is a welcome treat. 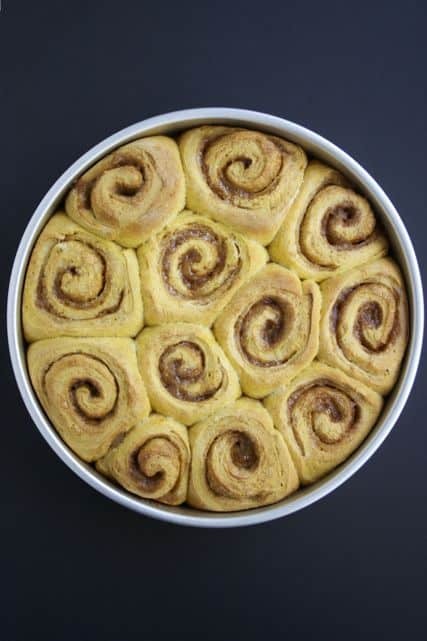 Ever since trying my first Cinnabon, I’d been on a mission to replicate the frosting as this is probably one of my favorite parts of the experience – that, together with the pull-apart-tender center of the bun itself. Never dry, never overcooked. One of the techniques is most definitely not to allow the buns to brown too much. A pale golden color signals that you are good to go while a brownish color is a sure signal than your buns will be dry. This is a little more tricky with these buns since the dough is already colored but the photo above shows the finished rolls out of the oven. Veryyy slightly browned. Don’t overdo it! These rolls were adapted from the popular cookbook Baked Elements via Smitten Kitchen. I believe the original recipe contained an error since the mixed dough, as directed, was more like batter and so it has been adjusted. Smitten Kitchen simply used less milk than called for, which is reflected in the recipe below. On another note, while I still have beets on my mind, I wonder how this recipe would translate using a small bit of beet puree in place of the pumpkin for the next holiday? Or maybe a red velvet breakfast roll? Prepare a 10-inch round pan by lining the bottom with parchment paper and buttering the paper. Dust with flour and knock out excess. In bowl of stand mixer, add dry ingredients and stir until incorporated. Stir together the dry ingredient and then add the butter and mix until combined. Roll your dough out to a 20 by 10 inch rectangle and brush with half of the melted butter. Roll the dough up, jelly roll style, into a long log and place the seam side down. I, along with a bagillion others. 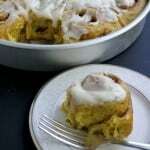 am in love with cinnamon buns/rolls..and yours, with pumpkin are no exception to that love. They look incredible, Maria!